Use the Windmills quilt block pattern to make blocks that finish at about 10 1/2 square inches. Six Windmills quilt blocks are shown in the illustration. They've been rotated from row to row and you'll discover other ways to rotate the blocks to create unique layouts. We could sew the block a more typical size if we pieced it with templates or used paper piecing techniques, but when sewn side-by-side with other Windmill blocks, a slightly unconventional finished size doesn't matter one bit. We'll sew the block in quarters. Split the block visually along its vertical and horizontal midpoints; it becomes obvious that the design is made up of four squares, with the majority of its patchwork from Flying Geese units. Each section of geese is flanked on two sides by large triangles. Small triangles are sewn to each end of a row of geese. The block's center could be constructed from a quarter square triangle unit, but we'll stick to individual triangles. It's most economical to use the no waste Flying Geese method to sew lots of identical geese. They're assembled in groups of four, and you'll need six each of the two geese types to make a block similar to the block shown. Two geese of each would go unused, so instructions using that method are for two quilt blocks. Repeat to make additional blocks. For another type of quick pieced flying geese, an angled seam is used to sew squares to the ends of rectangles. A portion of the square is trimmed off and discarded, creating waste. However, this method is a very good choice when using small pieces of leftover fabrics to make a scrap quilt. Instructions for the rectangles and squares method are at the bottom of page two. 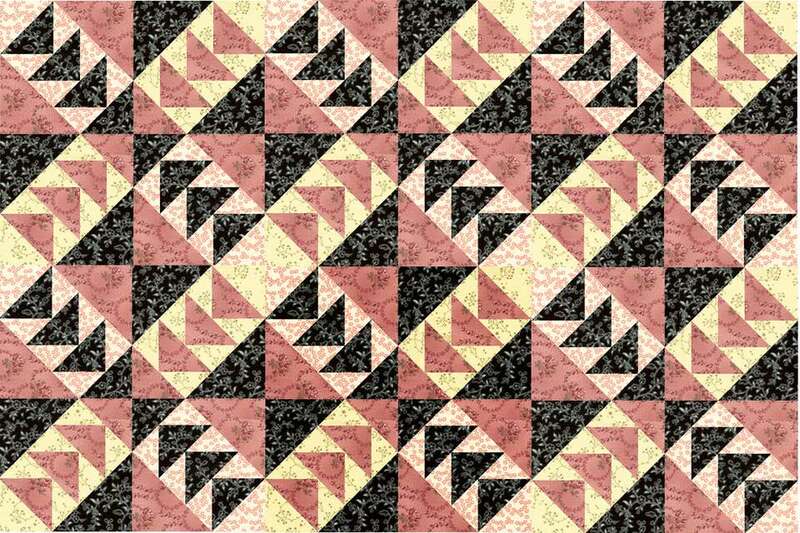 The block contains just four fabrics: a black print and a mauve print for geese and large triangles, plus two lighter prints for backgrounds. Use more fabrics if you wish. See the bottom of the page for geese assembly using rectangles and squares. Find a 4 1/4-inch black square and four of the 2 7/8-inch light squares that will be the backgrounds for the black geese. Draw a line on the reverse side of each light square, from one corner to the opposite corner. Use the no waste flying geese method to sew the small squares to the large square. The instructions are on two pages and may seem confusing at first, but is actually very simple and results in accurate flying geese. Read both pages before beginning. Repeat to make a total of 12 flying geese using the black/light squares combination. Repeat the process by sewing the other 2 7/8-inch light squares to the 4 1/4-inch mauve squares. You will have 12 more flying geese. All flying geese should measure 2 inches by 3 1/2 inches. Sew three identical flying geese together, one on top of the other. Repeat to sew all geese into groups of three. Cut each of the 3-inch by 3-inch black squares in half once diagonally. Center and sew one of the triangles to the top of a column of black flying geese. Press seam allowance towards the dark triangle. Repeat to sew the remaining dark triangle to the top of the remaining column of black geese. Cut the 3-inch by 3-inch mauve square in half once diagonally. Center and sew one of the triangles to the top of each column of mauve geese. Cut the light 3-inch squares in half once diagonally. Center and sew one triangle to the bottom of a geese column. Press. Cut each 4 1/8-inch by 4 1/8-inch square in half once diagonally. Center and sew a black triangle to each side of a mauve geese column. Press seam allowances towards the large triangle. Make three more identical units. Sew a mauve triangle to each side of a black geese column. Press seam allowances towards the large triangle. Make three more identical units. You should now have eight square units with flying geese running at a diagonal through their centers. Use a rotary ruler to check each square's dimensions. Corner triangles are generally rounded up to the next rotary cuttable size, and they could be a hair too large. If they are, use the square ruler to trim the excess, but take care not to remove the 1/4-inch seam allowance that must remain around each square. Refer to the alternate quick pieced flying geese method. Draw a diagonal line on each small light square, from one corner to the opposite corner. Sew one of the 2-inch squares to each end of a 2-inch by 3 1/2-inch rectangle (sew on the line as instructed in the tutorial). Make a total of six each of the two types of flying geese. Refer to steps five through 14 above to finish the quilt block (remember that cutting for this option results in one block, not two).